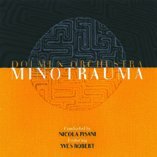 The emergence of the Dolmen Orchestra in the south of Italy has been a miracle. Conducted by Nicola Pisani and featuring Yves Robert, the second project of the Orchestra is dedicated to the myth of the Minotaur - a mythological monster with bull's head and a human body, a result of an unnatural act of love - and in partucular to the philosophical interpretation given to it by the Swiss writer Friedrich Durrenmatt. This second CD confirms that Italy enjoys two big-bands of equal standing, the other one being the Italian Instabile Orchestra.